Day +9 Update Plus What Next? So after almost 3 hours of the worst traffic that NYC and I-95 could throw at us (the rain certainly didn't help), Isabella is now home! And just in time for us to enjoy what is predicted to be a terrific weekend weather-wise. And if you thought Isabella had a big smile in the picture below, you should have seen her smile when she walked through the door! Since Isabella is still immuno-compromised, we have no plans for this weekend (except for a baseball game for me). So we'll just do a lot of nothing and enjoying the sun. As expected, and as you can tell from the picture, it's Day +11 and Isabella is starting to feel a lot better. It's been a while since she's felt good enough to smile, so it is definitely a relief to see it. All of her blood counts are good. The only thing we need for her to do is to start eating more and we can then go home. We hope to be able to go home on Friday, or on Saturday at the latest. We've only been here about 3 weeks now, but it has felt like forever and I know Isabella can't wait to get home. By the way, the picture above was taken after she completely destroyed me in Uno, leaving me with 16 cards in my hand! A few weeks ago, my cousin, Adlar, made a very touching request. He told me that he was going to be running in the New York City Marathon on November 1 and that he wanted to run in honor of Isabella. He would be running as a member of Fred's Team, which is a collection of runners with the goal of raising money for cancer research. Please take a few minutes to visit his site and if you can, give a couple bucks to show support for this amazing gesture. Below is an excerpt from his web site. Surprisingly, Isabella's white cell count has shot up and she is no longer neutropenic (low white cells, susceptible to infections). This means that her stem cells that we transfused into her 9 days ago are doing their thing and making lots of white cells. Unfortunately, now that the white cells are fighting off all the foreign invaders in her body, she has been feeling extremely bad with lots of pain. The doctors say that this is a normal side effect of a large spike in white cells and that she should start feeling better in a day or two. 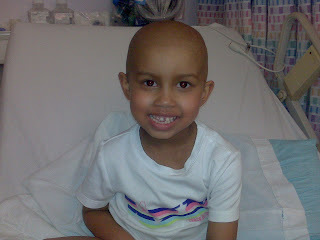 As Isabella continues to recover from her final cycle of chemo, we've been planning the next stages of treatment for her. First off, she will have an MRI to see what is left of the tumor. Then, we will be going through radiation therapy in Boston starting in mid-July to blast away any remaining cancer cells. The treatments run once a day for 6 weeks. Although we wanted to avoid radiation as much as possible, due to the size and infiltration of the original tumor, the chemotherapy was not able to eliminate everything. The Boston radiology folks did review Isabella's history and think that she is a very good candidate for the radiation based on how she's responded to the chemotherapy.